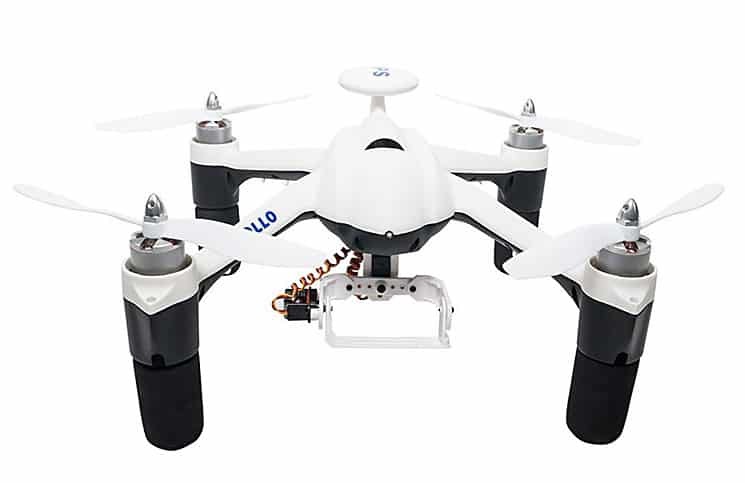 The quadcopter Apollo has an exciting black or white casing design with four large rubberized plastic feet that enables it to rest in landing position. The four blades of either model are white. The radio controller is large, with some great features, and a handy silver handle to carry it onto the flying field. It also has a gimbal that extends out from its base so a camera can be attached. It’s a great drone to have if you are a videographer or photographer wanting to create amazing aerial shots or footage. This is a cool-looking quadcopter that is sure to provide plenty of fun outdoors. Its unique design makes transport to the flying field simple. 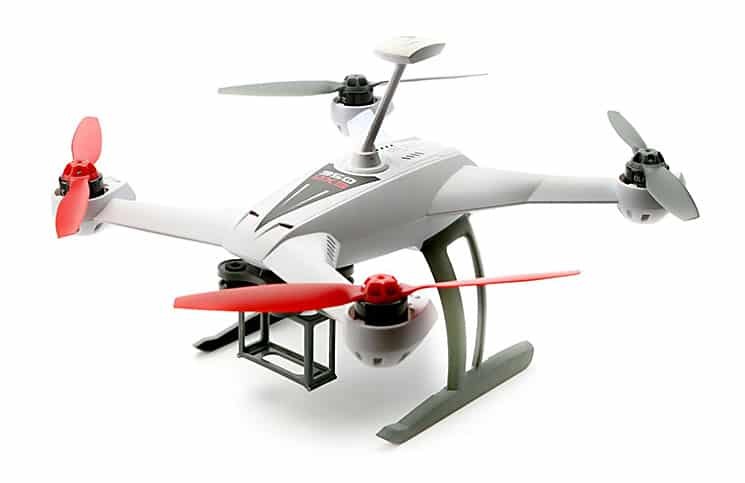 The quadcopter Apollo is an easy to fly model, and has been preassembled and tested in the factory. All you have to do is remove it from the box, charge it up and go. The Apollo drone has some great features. Multi-rotor aircraft require complex technology to keep them in the air. It will precisely hover in one position, with the aid of its self-leveling compass and GPS technology. The Apollo has an integrated iFly flight control system that includes a compass, barometer, and GPS. The quad will be able to hover in the air and hold its position. The quadcopter Apollo has a built-in autopilot system that takes away much of the effort of the drone pilot. This system uses GPS for navigation and to maintain flight stability. This system uses real GPS, and connects to at least four different GPS satellites. There are three different flight modes to enable the beginner to learn how to fly, and then once they feel their confidence growing, they can switch to the next level up. There is a stabilized manual mode which is a semi-autopilot, enabling the user to have some control, but with the drone still providing some protection from crashes as well. 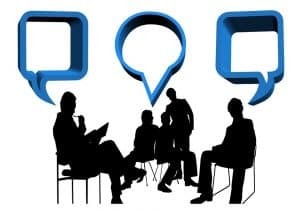 The auto hover mode is great as if you suddenly release the controls, it will stay hovering in the air, at a precise horizontal and vertical positioning. The auto hover mode is also the best mode for when you are just learning to fly, and it makes operating the quad the easiest method too. When shooting photographs or video, it’s best to stay in auto hover mode. This enables the full function of the drone to keep it from drifting or bobbing around. It keeps it from being susceptible from wind gusts as well. There is also a semi-autopilot function which can help the beginner learn how to fly, but gives them a chance to take over some of the control. For beginners who are just starting to learn, it has a fail-safe mode that will keep the quad safe from damage, and from loss. This fail safe is designed to work in multiple number of ways. If the Apollo suddenly loses its connection with the controller, it will return back to its starting position. This will also happen if it reaches a altitude of higher than one hundred meters, or a distance of three hundred meters. In any instance, the fail safe will turn on, and bring the drone back to its starting position. It will then safely descend back to the ground and turn itself off. The return to home GPS function will allow the user to flip a switch in the event that the drone has flown out of sight, or if they’re starting to get tired. The return to home feature will return the quadcopter Apollo to its starting position. This also works well if the charge of the Apollo is running low, so it eliminates any worries that the drone will suddenly drop out of the sky because it has no power left. The Apollo quadcopter is built with a two axis stabilization gimbal, which will enable you to shoot some great snapshots or video of the surrounding countryside with the addition of a great camera. This gimbal is built for Boscam and Go-Pro cameras, but any other similar light-weight camera can also be installed on the gimbal in minutes. This camera mount does more than just protect and hold the camera though. It actually is controlled by the flight controller system and is self-leveling, so you’ll always get great video, even if you’re being a bit unsteady on the joysticks. The pilot also has the additional ability to tilt the camera up or down by moving the nob on the radio controller. This enables you to get even closer for the best shots. The Apollo drone has bright LED running lights, so you can see it more easily as it flies through the air. These lights are also handy for when you’re outdoors flying at night time. You’re not limited to having fun with the Apollo only during the day time. The quadcopter Apollo takes two double AA batteries. It is built with four smooth and brushless motors. The quad is built with low voltage protection, so that you won’t have to worry about your quad crashing because it might run low on power. You can add on a GoPro action camera or a Boscam FPV camera, or other lightweight camera of any brand. You’ll be able to buy the Apollo drone for around $600 to $700. It’s a premium quadcopter that will suit drone enthusiasts who are only seeking the best. In the box is also the radio transmitter, which works at a frequency of 2.4GHz. You won’t need to purchase a separate one, like with other premium brands of drones. All you have to do is purchase a separate set of eight double AA batteries, or 8 rechargeable batteries. The Apollo Quadcopter is for the drone enthusiast who already has a Syma, Parrot, and UDI and wants to try another great manufacturer’s quadcopter. No matter their flight level, there’s some exciting features to interest everyone.